1 kit - includes 8 items packaged conveniently in a black mesh cinch bag: Grime Bar, Wonder Wash (4oz), Hand Sanz (2oz), Aloe Gel (2oz. ), Recovery Rub, Herbal Armor Insect Repellent, TerraSportSPF30+ and Lip Armor. 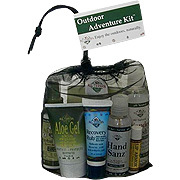 Outdoor Adventure Kit - 1 kit is shipped in a discrete, unmarked package. Orders are processed immediately and usually takes about 3 to 5 working days to be received. We do ask that you try it for 2 to 3 weeks to feel the full effects. Any information received is used only for order processing and shipping purposes. Your information, such as e-mail address, will never be disclosed to a third party.